Shauna C. Bryce talks with aspiring lawyers at Envision’s National Youth Leadership Forum, outside Washington, DC. Law school is a big decision—and a hefty investment of $200,000 or more. These are not solid reasons to invest $150,000 to $200,000 in a law degree. The decision to attend law school should be driven by the reality of career options for lawyers, not by fantasies stirred up by the latest legal drama on TV. Where geographically do you want to work? Every law school has its own sphere of influence. If you want to work in San Francisco, for example, then attending a community-based law school in Michigan may not be the best choice. On the other hand, the Top 3 law schools (and some others) have brand-name cache and powerful alumni networks around the globe. What type of employer do you want to work for? BigLaw, for example, gets the most publicity and generally pays the most. But large law firms tend to only recruit students from Top 10 law schools and the top five percent of students from local schools. Community-based and local law firms, on the other hand, tend to prefer graduates of nearby law schools. Are you a hands-on learner? Or do you excel in the classroom? BigLaw stresses academic performance and pedigree, and is generally willing to provide hands-on training for entry-level attorneys. Small law firms often look more closely at practical skills training and practice readiness, and often needs entry-level lawyers who can work profitably and productively from Day One. What is your expected salary? The average earnings of lawyers can be deceiving. A tiny percentage of elite attorneys earn top dollar, with billing rates exceeding $1,500 / hr or total compensation packages of $850,000 and above. But most attorneys’ highest earning power will be far below that. Be realistic in assessing whether your earning power will be high enough to justify investing in law school. And if you’re already out of college and working, you have additional opportunity costs to consider. Earning your JD isn’t the end-goal, it’s the beginning of a career. Too many students go to law school without adequately thinking about their long-term goals—even though which law school you attend (and how well you do there) has a profound impact on your career options from Day One until retirement. Is law school right for you? Or is there another way to reach your long-term goals? Which law school should you attend? The highest-ranked, the closest, or the one that provides the best financial aid package? How will you finance your education and living expenses, which may be an additional $150,000 to $200,000 over your college expenses? How can you get assistance preparing your law school applications, including student résumé and personal statement? What college majors and activities should you consider to increase your odds of getting accepted to law school, increase your law school performance, and open specialized opportunities (like patent law) after law school graduation? If you’re thinking about earning your law degree—or you’ve already decided to attend law school and need help putting together your law school applications, then let us know. We have counseled aspiring law students on the big decision to go to law school, as well as applying for law school. 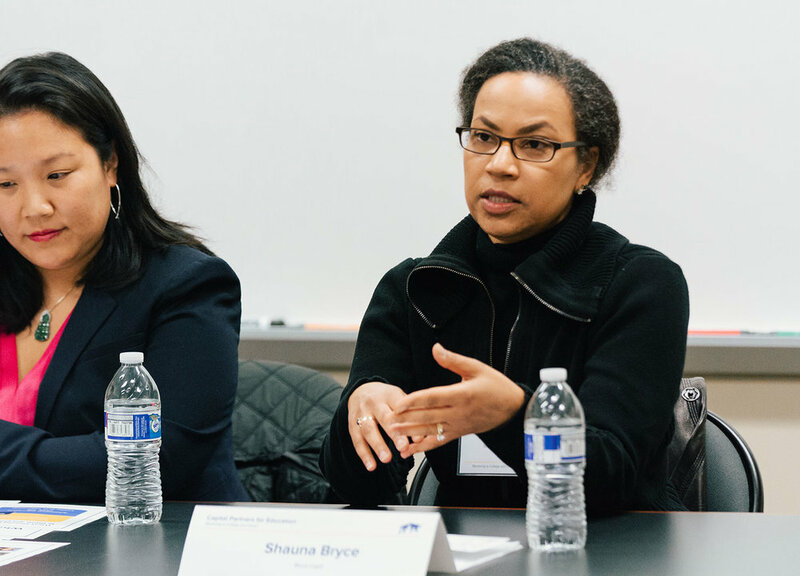 Shauna C. Bryce speaking on a Capital Partners for Education (CPE) Legal Advocacy panel moderated by Deborah Tang of Major, Lindsey & Africa and hosted by George Washington University Law School in Washington, DC. Ian E. Scott, Esq.’s “Law School Lowdown: Secrets of Success from the Application Process to Landing the First Job” examines every step of becoming a lawyer, teaching you how to evaluate the choices you face so you can make smart decisions about your future, and increase the odds that—even in this competitive economy—you will become full-time, paid attorney in the practice areas of your choice. This is a resource that can save you a lot of hard, expensive lessons. Need Help with Law School Applications?